Pretty in Pale: Who said it? 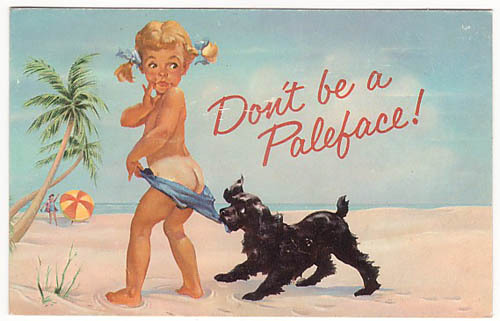 "Don't Be a Paleface"
Did you know that good 'ole Coppertone's slogan used to be "Don't Be a Paleface"? How crazy is that? I wonder what people will be saying 50 years from now about some of our advertising campaigns. And now that it is proven that tanning changes dna, and with the melanoma warrior community demanding to be heard hopefully EVERYONE will understand that tanning is as deadly (and stupid) as smoking! Can I simply say what a relief to find a person that truly knows what they're discussing over the internet. You actually realize how to bring an issue to light and make it important. More people need to look at this and understand this side of your story. It's surprising you're not more popular because you surely have the gift. Useful tips here. It is very helpful for me because I can to know about these things. This is very nice post! I will bookmark this blog it The e-cig has been current for almost three years and is a amazing device targeted at offering cigarettes customers with a better option. Obviously also useful in helping to reduce and indeed stop smoke cigarette smoking cigarettes completely. Are looking Best digital cigarette, V2 cigarettes voucher & Green smoke cigarette smoking cigarettes coupon? i am visiting this web site dailly and take pleasant information from here daily.